The Country Christian boys' basketball team is off to a solid start, especially when compared to last year's season openers. In 2017-18, Country Christian was 0-7 to start; in 2018-19, the Cougars are now 4-3, including a pair of league wins, most recently over Portland Waldorf. On Tuesday, Dec. 18, Country Christian took to the road and picked up a win 51-49 over the Wolfpack. That win made it two in a row for Country Christian, while Portland Waldorf fell to 1-4 on the year. It was a close game throughout. Country Christian actually trailed the Wolfpack at the end of the first quarter 12-10, but managed to turn the tide by the end of the half. The Cougars led 25-24 going into the locker room. The tide once again turned in the third quarter, when Portland Waldorf outscored the Cougars 18-13, leaving a 42-38 mark on the scoreboard heading into the final stanza. It was in the fourth quarter where Country Christian gritted its teeth and got the job done. The team outscored the Wolfpack 13-7 en route to the win. There were a few factors that led to the Cougars victory. On the road, they were able to outrebound the Wolfpack 38-37, and picked up 20 assists and 5 steals to boot. 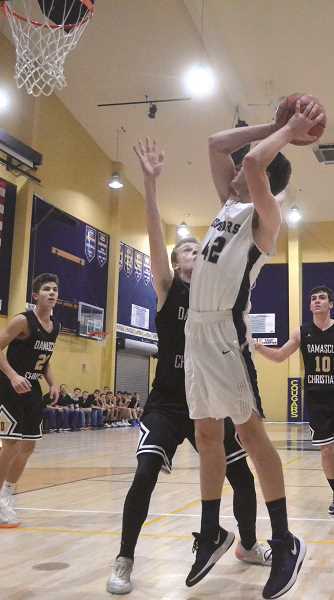 While the team made fewer second chance and shot a lower percentage overall from the field, the Cougars took more chances which led to two more baskets, which were ultimately the deciding factors. Country Christian was led scoring-wise by juniors Chris Lambert and Mark Grandle with 13 points apiece. Right behind them with 9 points was senior Drew Halverson, who also dominated the boards, hauling in 16 rebounds, and managing 10 assists in the game as well. The Cougars followed that up with an equally impressive victory over league foe Southwest Christian 45-34 on Thursday, Dec. 20. With that decisive win, Country Christian's record now stands at 5-3 overall, and 3-2 in The Valley 10 League. Up next is a non-league encounter against South Wasco County (5-3) on Thursday, Dec. 27.